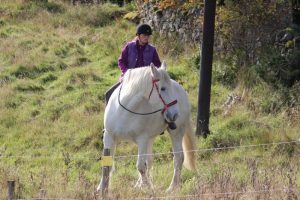 When the weather prevents us from doing more, or even small injuries when stabling is required, there are still small things done slowly that can be done to help keep our horse/heart connection and our horses minds exercised. Here is a list of things I do when our Winter puts a stop to big time play or riding, hope it helps you too. Go nice and slow to start off, build up to more flapping but see what things you can rub on your horse and then around him at a distance. 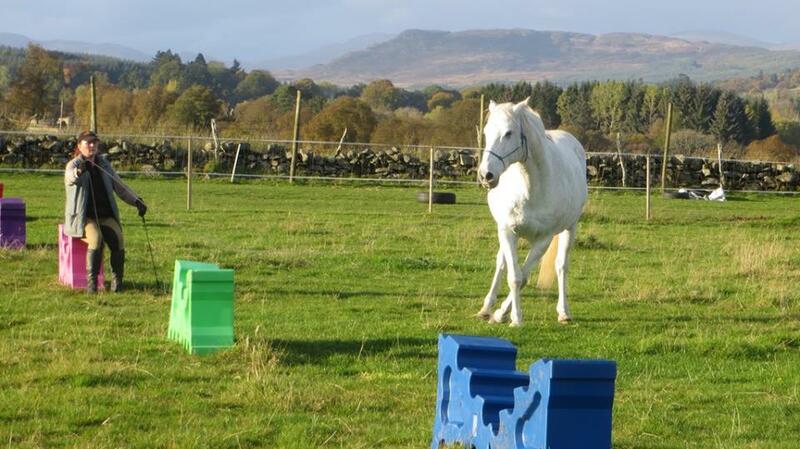 Try areas around him, high, low, in front, beside, behind and work on approach/retreat if something is worrying always releasing when your horse relaxes. This relaxation will get better as you work on releasing at the right moment, when he is calm and happy. 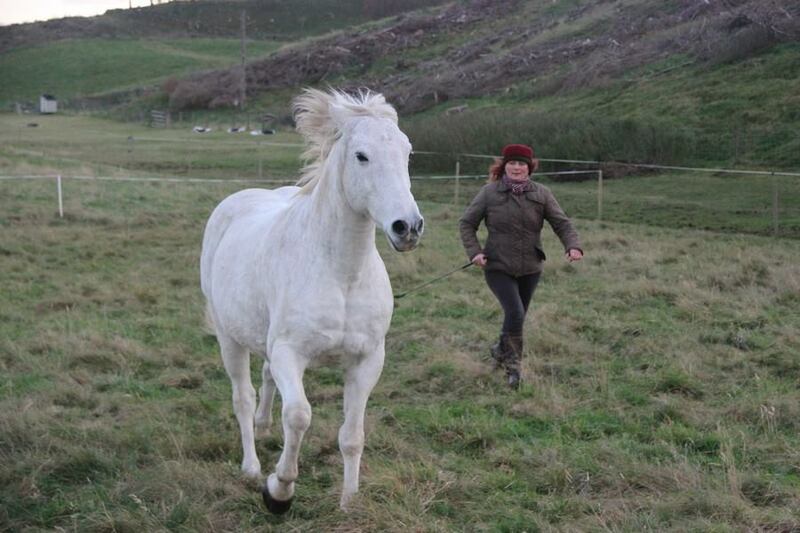 Try things like: Bags, balls, flags, bunting, stick/string, rugs, tarpaulin, cone on bum, feed bucket on bum, being near a curtain or going under a curtain or washing line (you could set up a curtain/line at stable door once your horse is okay with flapping plastic), you walking like you’re drunk to and around him, umbrella, rattles (can put small stones into a small water bottle), whistles, singing, fireworks (use a firework cd) saddle, bridle. Can you take a saddle pad and ask for relaxation of the head as you slowly approach/retreat it up his neck…he’ll learn to lower his head when something is worrying on his neck and it’ll fall off over his ears rather than raising his head. Can you touch him ALL over without worry. Can you go under his belly….only when totally good with everything…a very BIG ASK. 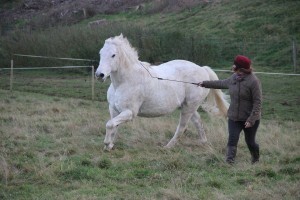 See if you can bring his head down for relaxation, work with your hand behind his ears (poll) or slight pressure on rope/halter under chin first. Does his head come up when you try moving your hand quickly near his head? 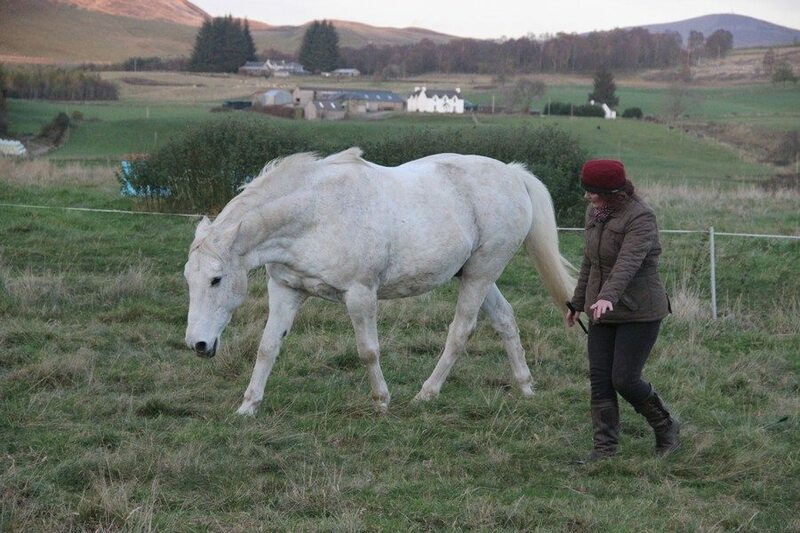 Can you put a wee bit of pressure on the rope under halter to ask him to relax down when you do this, if he drops his head immediately then stop moving your hand for a quick release for him…this can help to train him for a response of relaxation if in a difficult situation. 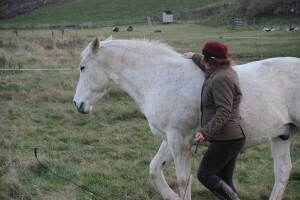 Can you ask for his head down with your hand over his neck to halter and bridle him. This helps to bring relaxation but also to help put his teeth in a good position for him to ‘take’ the bit himself and not knock his teeth in the process if you are bitting your horse. Can you ask him to move one step sideways to put his side on wall. This also will help with claustrophobia and trailer loading. Can you ask him to put a foot (or place a foot with your hand or rope around leg) in a bucket or on a breeze block, on a carpet piece or on a tarp – just one foot. Once he’s done one foot try working on another etc. Can you teach him to ground tie? Can you teach him to back up from his tail? Can you teach him to move forward with a rope around one front leg? Can you back him into stable working first with bringing him out, in, out etc. Can you back him out of a stable, working as above. While keeping your feet still can you ask him to move one or two steps backwards and one or two steps over/away from you and touch a cone? 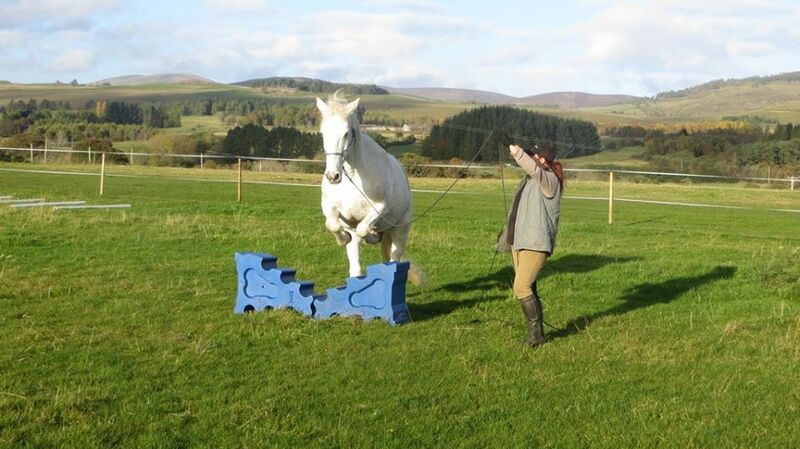 Can you ask him to sidle to a mounting block. You can work on asking him to move over to a wall first as in the FEEL game. All of these are for just one or two steps, nothing big or fast. Can you half circle/squeeze him into his stable? Can you half circle/squeeze him out of his stable? Can you ask him to back up one/two steps before putting his feed down? Also think about getting one obstacle and working all the above with that ie: a plastic bag. Can you use if for familiarisation in all areas. Can you ask him to put his front foot then back foot on it. Can you ask him to sidepass over it. Can you ask him to squeeze over it and round it etc. See how much you can do with just ONE THING. Maybe print this out and tick things off as you work on them and I hope that gives you some fun things to try out that are do-able in a small space without much movement. How good is your Connection to your Horse? and do you test it? Can you connect from the shoulder, to his front feet? Can you connect from in front of your horse? Can you connect from the hips, to his back feet? Can you connect from behind? AND can you connect to all these places in walk, trot and canter AND from both the left and right? Can you also do that online AND at liberty? And can you then take that connection into your riding? 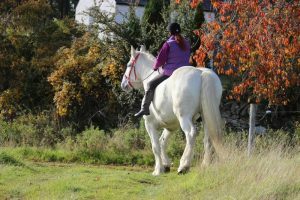 Once you have a good connection with your horse can you try connecting in different ways? Why not try sitting down the whole session or standing up on something (stay safe or at liberty for this one) or get longer and longer ropes for distance work. If you are only used to using a 12′ line then try a 22′ one and if you use a 22′ line then maybe try finding a longer one. I know that once my own connection got better on longer ropes my Liberty work was better too. Testing things is a great way to bring in variety to your play sessions and a great imagination is good too. Solly in the pics is circling with jumps. When I stand still he can jump two jumps on that circle = Consistency. When I start walking doing ‘moving circles’ we go to the next jump up = Variety. 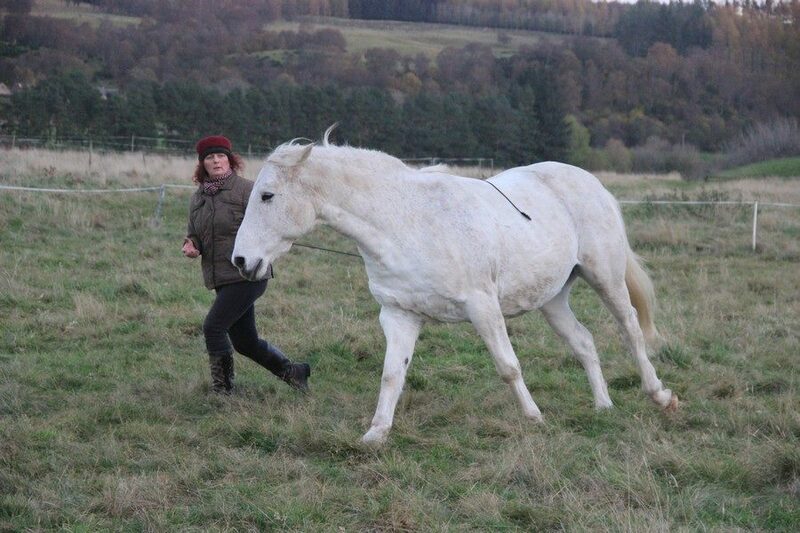 My 4 HorseSavvy criteria basics are what I use for a good session with my horses whether it’s long or short. Finding each of these main 4 things in all that we do is important but the first one, relaxation, is the key to all the others being good. Relaxation is needed in all things to help the horse learn, a worried horse cannot learn. Cooperation is what is needed to have a partnership, a bond, a connection and our breathing/energy/body cues get more and more invisible for that connection to be great. Impulsion is when your whoa equals your go, on a scale of 1-10 impulsion is a good 5, easy abd light to go, easy and light to halt. Flexibility is where your horse is equal in muscles to his left and right, to have this symmetry is vital for straightness in all you do and allows you to not have to use your reins to keep your horse straight. When riding or just playing these things are good to keep an eye on. 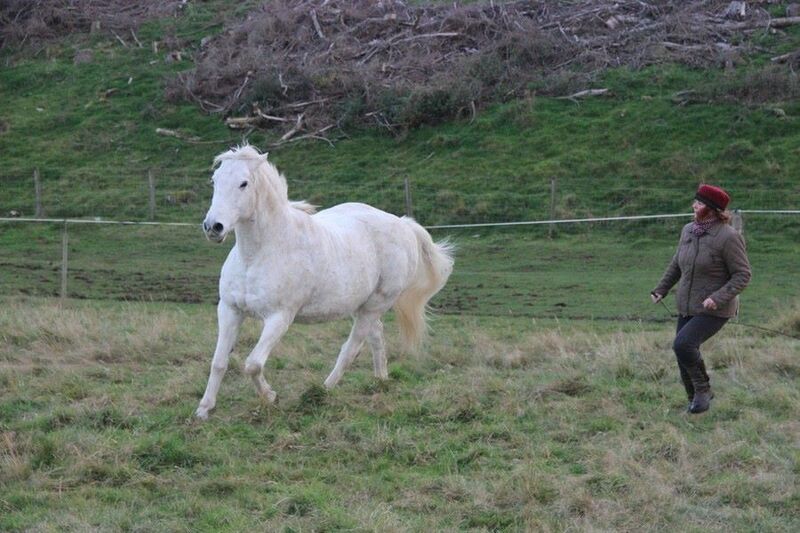 There are many reasons you might want to walk your horse out instead of riding out. Your horse may need fittening up or he may be unrideable but okay to walk out so it could be great exercise physically and fun mentally for him. 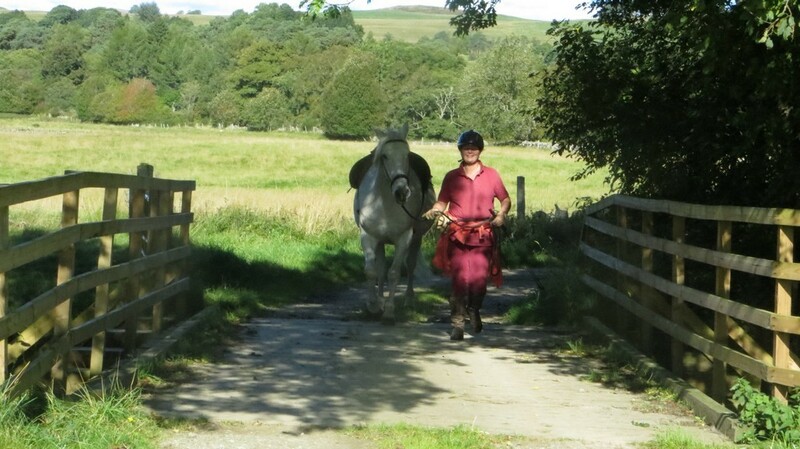 You may be working on getting a better relationship with your horse so walking out would really help you bond OR you may just enjoy walking your horse out. 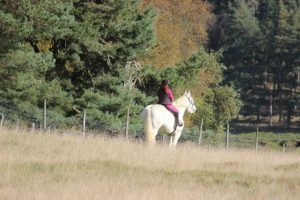 Sometimes, when a horse is sceptical or worried about being out hacking it can help to walk out in-hand regularly to familiarise to different surroundings, sounds, sights and smells. 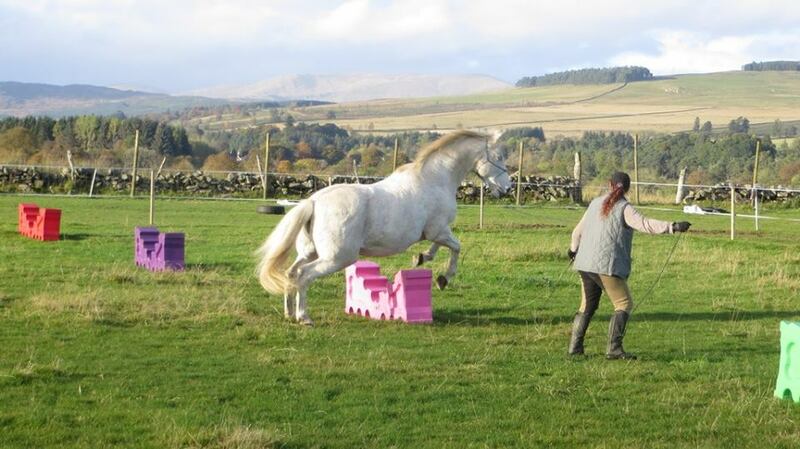 Once you get used to things you can always decide to mount and ride a bit and if you are riding you can always decide to jump off and walk a bit too. For Solly and me, walking out in-hand is really helping us to bond in an unfamiliar environment, it helps us look at things together face-to-face where I can read him better. I also have two ageing dogs and this helps give me my much needed exercise. I really enjoy walking out and it’s great to have my good friend Solly out with me. 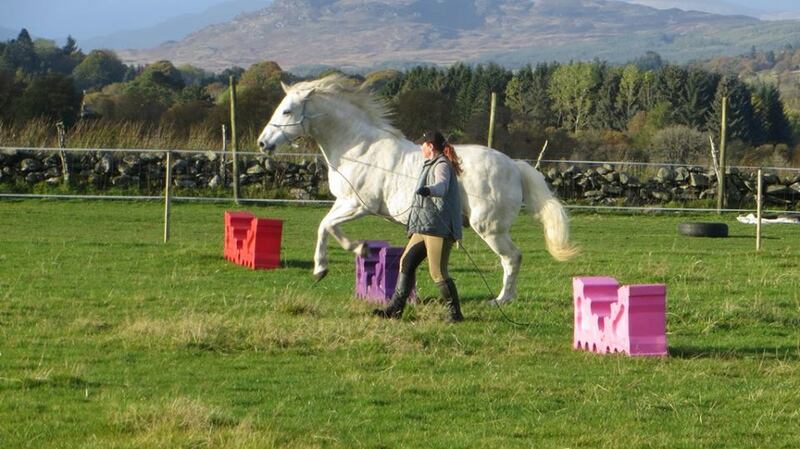 Using kind consistency with our horse training is a super way of helping our horses learn, some horses love a good solid routine. But it can often become boring if overdone and some horses hate being bored SO we need to learn the art of becoming balanced between being CONSISTENT and SPONTANEOUS. 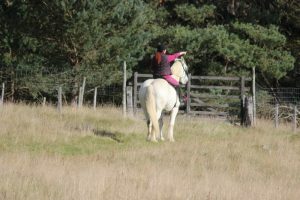 Yesterday I wanted to do something with the horses but with the weather being on/off I didn’t plan anything, in fact I didn’t even take saddles or bridles. When the weather stayed dry it was a ‘LETs DO IT’ moment and I took the opportunity and played/rode both boys with what I had….rope halter and reins for Solly and used those reins to make a cordeo for Stormy. The pics show the end of a completely spontaneous play/riding session. We hear a LOT about ‘collection’, being ‘on the bit’ and ‘engagement’. What exactly is this and how do we find it? 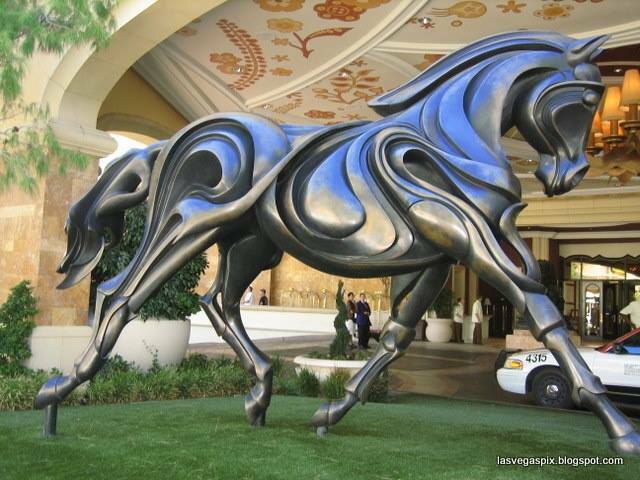 The picture above is a sculpture of a horse in ‘self-engagement’. It clearly shows how the whole horse is lifted up, balanced, light and engaged. Engaged from the back hooves, up through the body which lifts the belly and ribs and lightens the forehand and neck which automatically brings the upper neck and head towards the chest with the poll highest. 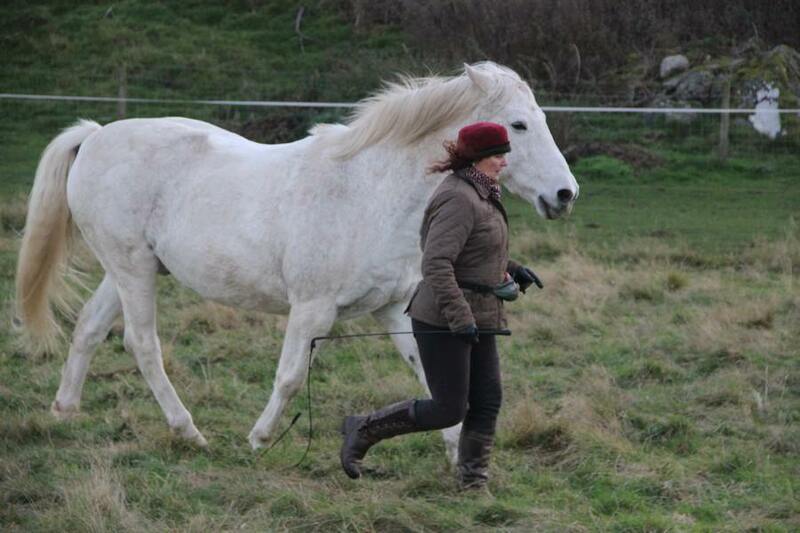 Look at the fabulously smooth line from the hocks to the ears over the horses back…beautiful. The symmetry of the trotting diagonal legs, they’re matching in line and energy and finally the high poll of the head and the proud headset. SO…how do we attain this with a bridle? 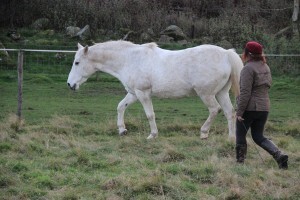 Well for me I work with ground work first, helping the horse to become more symmetrical left and right, lateral flexions, and once they have the balance with that then I work on asking for longitudinal flexion, long and low to find relaxation across the top of the spine, through natural horsemanship techniques. With the balance working left and right and then with a relaxed low head, which helps to stretch the back and neck and build good musculature there, it is THEN that I start to ask for that relaxation with energy from the hindquarters to help create the powerful ‘engaged’ feel and look of the horse you see in the picture. 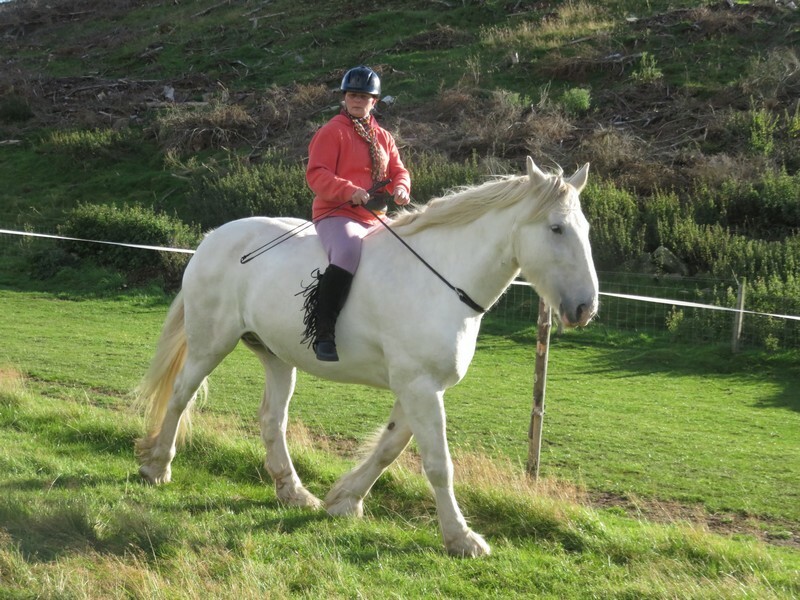 It can take quite some time for a horse to be fit, muscles with relaxation do not happen overnight, it’s asking the horse to ‘body build’, to have a strong, flexible core and to be able to hold that posture for longer and longer. To be able to find this core strength is great and once done well on the ground then we can work on the same principles and training techniques when riding. The horse gets a stronger body with fit muscles which helps them to carry our weight well. Putting ourselves on the horses back changes the balance of the horse so working on techniques that allow the horse to then find the energy and power from his hindquarters through to the poll over his back when ridden is hard, the reins really have nothing to do with it. The reins, when working correctly, are used to help refine the cues and are taken up when they become slack due to the horses head NATURALLY becoming higher, lighter and proud. 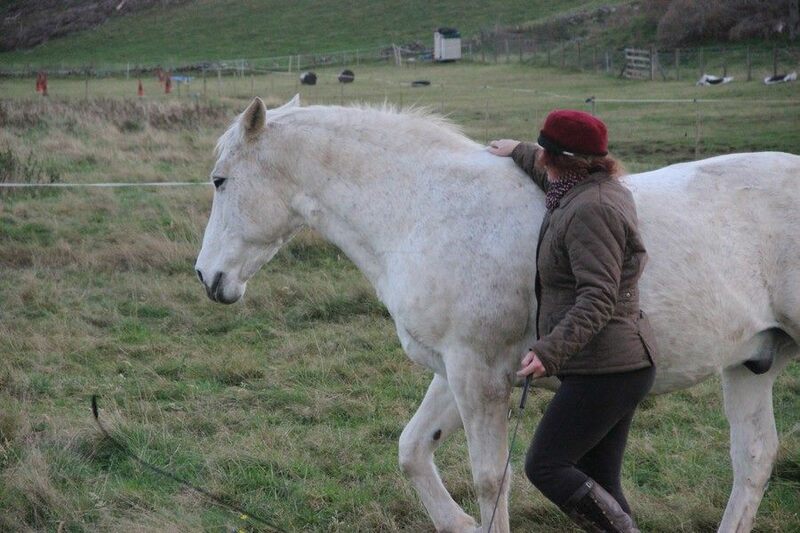 Pulling the horses head in through the bridle/reins is an incorrect way of finding ‘engagement’…it is merely a ‘headset’ created by the hands. Engagement is created through the horses core strength, fitness and balance through working from back to front, hindquarters to poll. Every horse knows naturally how to do this when they play or show off with other horses. 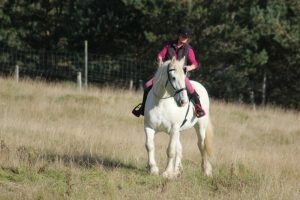 They often don’t do it for long unless a stallion so to achieve this for us to ride is an art not just one technique..
Our training should help fitten the horse through the ground work, to help them find self-carriage so that they are relaxed, flexible and able to carry us. 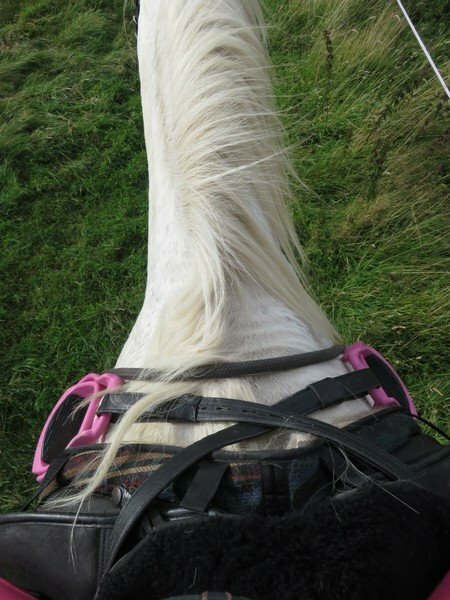 For us to then ride ‘quietly’ and get out of the horses way so that he can do just that when being ridden is how ‘engagement’ occurs. In addition to all of this, WE need to be fit enough through core strength and self-carriage to be able to ride such a wonderfully fit and healthy horse. Going back to some basic’s is always a good idea as the foundations of good horsemanship and riding are doing the simple things well and then with excellence. 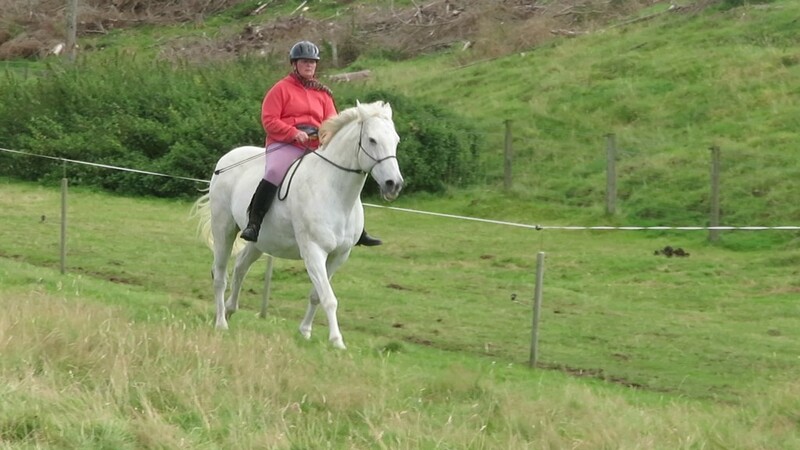 So today Solly and I did some good freestyle riding….stirrup-less and with the reins laying on his neck. I find this sort of basic thing really improves my balance and focus and helps me see how well my riding connection is.